Laurie Marker (2013-2019)—is one of the world’s pre-eminent wildlife conservationists, internationally famous for her innovative, holistic thinking in designing multidisciplinary approaches that conserve biodiversity through the promotion of sustainable human development. Her career began as a wildlife biologist working on the care of captive animals in zoos. She developed an affinity for cheetahs and began to incorporate in situ conservation research in Namibia, Africa. In 1990, Dr. Marker single-handedly built the Cheetah Conservation Fund (CCF), which works to save the wild cheetah and its habitat through education, public outreach, applied conservation biology and management, public policy and science and research. The CCF’s education program works with Namibian farmers, students, educators, and public policy makers to help them understand the value of sustainable practices in conservation as well as the importance and value of predators for a healthy ecosystem. There are also CCF affiliates in other countries—Kenya, Botswana, South Africa, Algeria, Angola and India. From the beginning she was on the cutting-edge of conservation science—her early biomedical research identified a degree of genetic similarities in the cheetah population that significantly effected conservation efforts. She worked with land-owning commercial farmers to improve their livestock husbandry to reduce predation and demonstrate the indiscriminate trapping and or killing of cheetahs was not necessary. To expedite this effort, she began a highly successful program of breeding and distributing over 300 Anatolian shepherd dogs to protect livestock from the cheetahs. During the early phases of her work with the CCF, Dr. Marker performed ecological research on cheetahs in the landscape and biomedical research on over 1000 cheetahs who passed through the Center as they were relocated to reduce conflict, raised as orphans or recovered from injury when trapped. 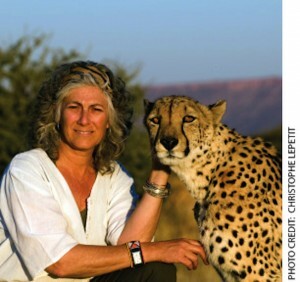 In recognition of the changes she has introduced regarding how people approach conservation when humans and wildlife are in conflict, she has received numerous international awards, including being named as a Time Magazine “Hero for the Planet” (2000) and a Tyler Environmental Award Laureate (2010), as well as receiving the Explorers Club Lowell Thomas Award (2010) and the Ranier Arnhold Fellow Award (2011).